CANTON, Mass. 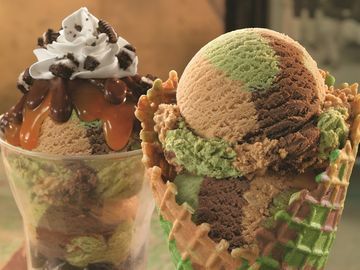 (October 5, 2011) –Baskin-Robbins, the world’s largest chain of ice cream specialty shops, is supporting Kraft Foods in its mission to donate 25 million meals to Feeding America®. During the month of October, for every scoop of Baskin-Robbins’ October Flavor of the Month “Trick-OREO-Treat” ice cream sold, one meal will be donated to Feeding America. Scoops of this limited time only Halloween flavor, featuring Vanilla ice cream packed with Halloween OREO® cookies, BABY RUTH® and Butterfinger® candy pieces, will support Kraft Foods HUDDLE TO FIGHT HUNGER, a call to action encouraging families, retailers, communities and employees to help provide meals to those in need throughout the country. Vanilla ice cream base, made with fresh cream and real vanilla. Halloween OREO® Cookies- As AMERICA’S FAVORITE COOKIE®, OREO® has been a part of memorable family moments for nearly 100 years. BABY RUTH®- Introduced in the early 1920s, BABY RUTH® is a leading confectionery brand that satisfies your desire for a hearty candy bar with great American taste. Butterfinger®- Even after all these years, this delicious crispy crunchy, peanut-buttery candy will still make you say "Nobody's Gonna Lay A Finger On My BUTTERFINGER®." In addition, The Dunkin’ Donuts & Baskin-Robbins Community Foundation is making a donation of 500,000 meals to Feeding America. The partnership between The Dunkin’ Donuts &Baskin-Robbins Community Foundation, which serves the basic needs of local communities through food for the hungry, safety and children’s health, and Kraft Foods, which is serving local communities by building local community support in the fight against hunger, is a great match. BABY RUTH® and BUTTERFINGER ® are registered trademarks owned by the Societé des Produits Nestle S.A. Vevey, Switzerland. Kraft Foods Inc. (NYSE: KFT) is a global snacks powerhouse with an unrivaled portfolio of brands people love. Proudly marketing delicious biscuits, confectionery, beverages, cheese, grocery products and convenient meals in approximately 170 countries, Kraft Foods had 2010 revenue of $49.2 billion. Twelve of the company’s iconic brands – Cadbury, Jacobs, Kraft, LU, Maxwell House, Milka, Nabisco, Oreo, Oscar Mayer, Philadelphia, Tang and Trident – generate revenue of more than $1 billion annually. On Aug. 4, 2011, Kraft Foods announced plans to divide and create two independent public companies: a high-growth global snacks business with estimated revenue of $32 billion and a high-margin North American grocery business with estimated revenue of $16 billion, based on 2010 financial results, adjusted for divestitures. The transaction will take at least 12 months to complete, during which time plans regarding the structure, management, governance and other matters will be announced. A leader in innovation, marketing, health & wellness and sustainability, Kraft Foods is a member of the Dow Jones Industrial Average, Standard & Poor's 500, Dow Jones Sustainability Index and Ethibel Sustainability Index. Visit kraftfoodscompany.com and facebook.com/kraftfoodscorporate.